' Mother Nature '...is Unpredictable. October 18, 2012. Due to an unexpected complication we had to interfere in order to assure/maintain the wellbeing of our girl Jayda. After surgery took place she is now doing well again and hopefully on her way to a full recovery. We, at Fanchon/Dunley, Thank You ALL for your kind words and expressed trust in us and our dogs as we value that very highly! born during the third week of October. Pictures of Jayda’s first offspring can be seen in section by visiting the page LINK as well by clicking on he LINKS about Jamie that are mentioned/posted below at subject: ' Picture and Info Jayda'. 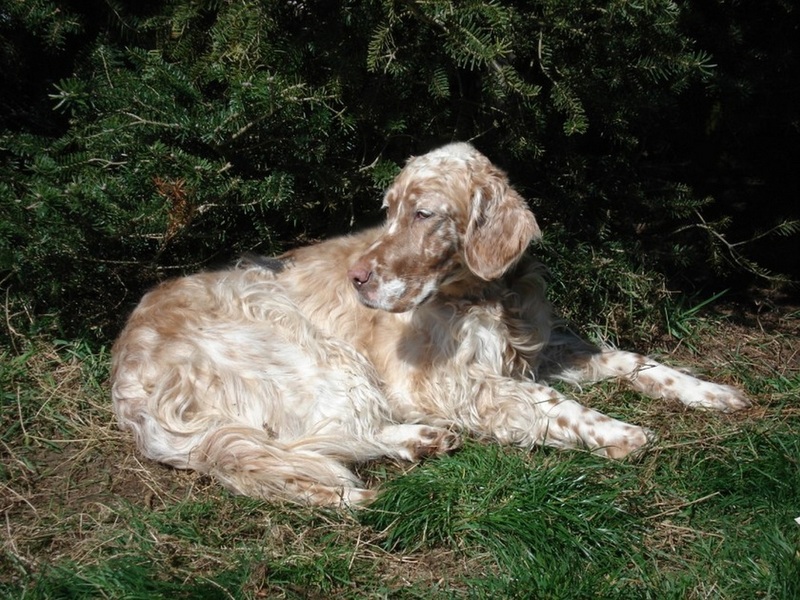 Dad and Mom's pedigree includes many of our finest and successful English Setters in our History. Inquiries are welcome and we appreciate when done by using our contact page form. Thank you for your cooperation. Below the Videos of the Ultra Sound Check. Health clearances Sam and Jayda. 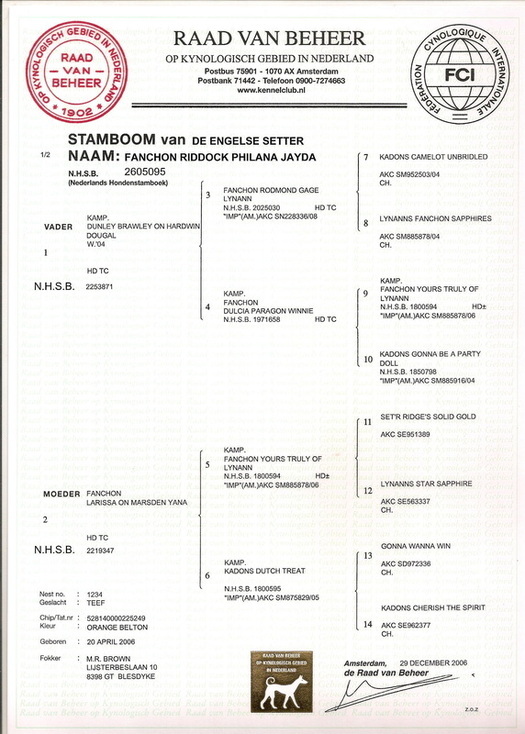 Below posted the pedigrees and the official health certificates of Sam and Jayda that concern their Hip dysplasia and the BAER (hearing) - test results. 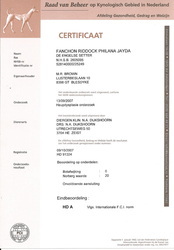 All documents are issued by the Dutch Kennel Club and registrar in the N.H.S.B pedigree and GGW- (health department) data banks. 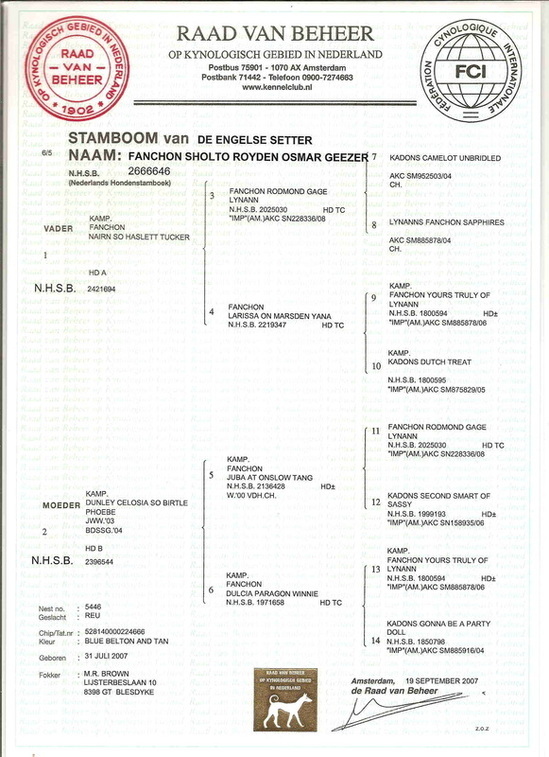 Noted: We usually do not breed combination of dogs that are lesser than FCI-norm A or at least one of dogs (in a combination) needs to have a HD score norm- A to match with a dog that has at least a HD score: FCI-norm B. Any combinations of dogs with Hips FCI- norm B X FCI-norm B or even norm-B2 (signs of hip dysplasia) are excluded. Jayda is a 6 year old sweet girl ...but likes to have things her own way. Expected litter will be her second and we hope she will produce the same kind of pups as she gave us before. She has excellent health clearances (Hips/BEAR test). Her official results are posted below. 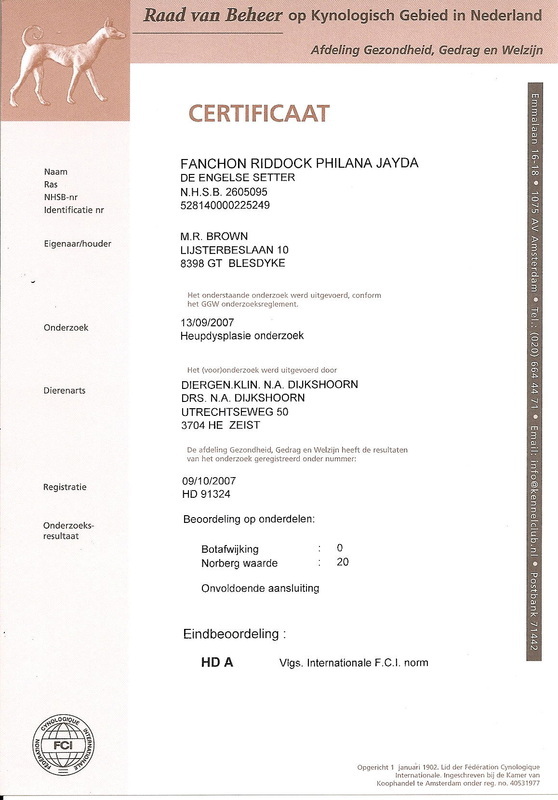 From her first litter we kept the male Fanchon Paints It Black Jack (Jamie) and how he developed (pictures) can be seen on the following LINK, LINK , LINK, LINK and LINK . Noted: Jayda is not show trimmed as she is losing/shedding most of her coat. Sam is a dog with a very gentle personality and a true gentleman. He fully qualifies to the description.. ' Gentleman By Nature '. Thus his hunting instinct is very much present as during the day he likes to roam the fields for any game he can find. He is Offspring out of a 4th generation of line breeding and the careful selecting of his ancestors. Never compromising the goals as set in our strict breeding policy and only breeding with dogs that have all the health clearances as well great personalities since we value these qualities to be equal important, essential and always a necessity prior to undertake any breeding or any combination with dogs that have been or will ever be bred by us in the future. 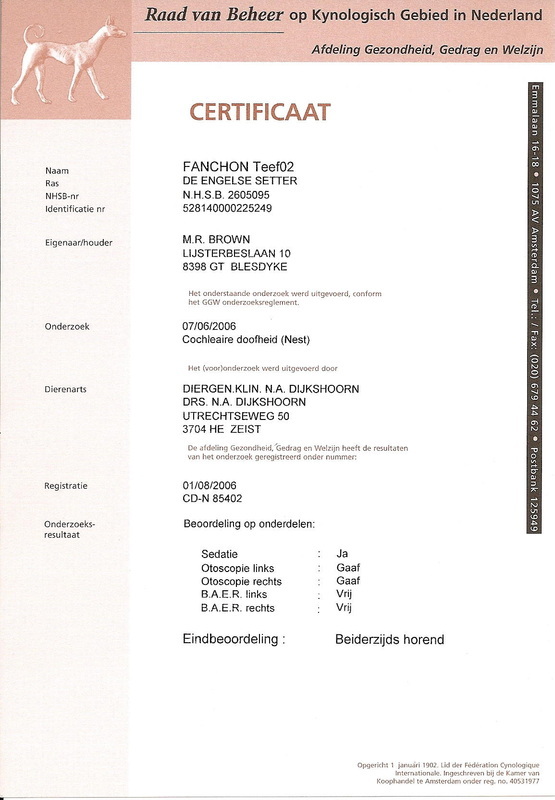 Only 'these' dogs that are used in combinations that can meet these standards and able to qualify with our breeding policy are considered to be suitable in order to acquire their FCI registration names that either start with our official registrar kennel names: Fanchon or Dunley. 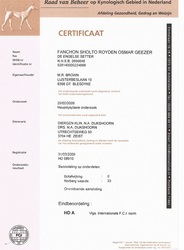 Hip dysplasia (HD) result: Sam is the second male dog from this litter (sibling) that became a Dutch Champion. 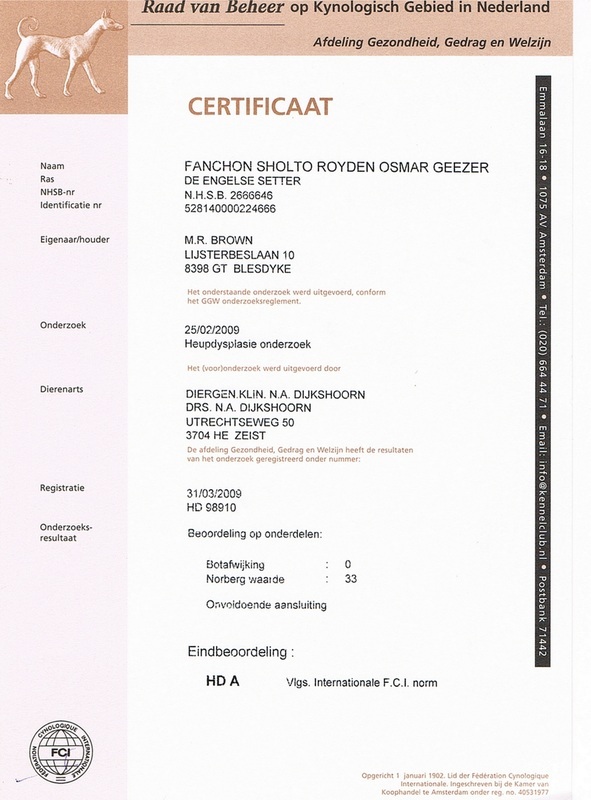 Out of this litter 2 males have been tested for Hip dysplasia and both are clear (qualification: free of Hip dysplasia) receiving their official certificates with results FCI-norm- A. 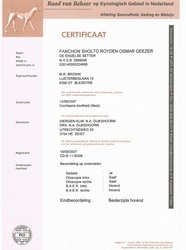 The certificates are issued/ submitted by the health department (GGW) of the Dutch Kennel Club (Nederlandse Raad van Beheer Op Kynologisch Gebied in Nederland). About Willy Walker Pedigree Database. 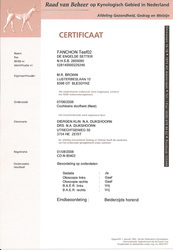 We recommend to visit and use this data base to check for health status on dogs as recently Mrs. Andrea Strobl has added function(s) that enable visitors not only to search for pedigrees but now also for health clearances/or the health status (HD/ED/BAER/Dentition etc.) of a particular dog when it's available or submitted by the owners and/or by the breeder(s) of these dogs. Sire: Ch. 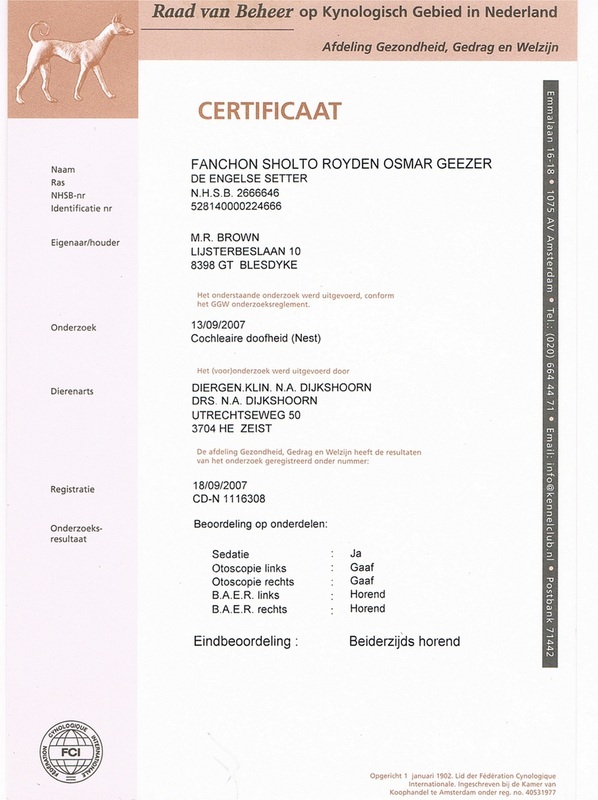 Fanchon Sholto Royden Osmar Geezer (Sam) X Dam: Fanchon Riddock Philana Jayda. Both parents have Excellent Hips scores FCI -norm A (qualification: free of hip dysplasia and are BAER tested with results: Double sided hearing (Bi-Lateral: normal hearing). Sam is a Tricolor (Blue Belton and Tan) and Jayda an Orange Belton. Expected colors of the pups: Orange, Blue and Tricolor. Sire and Dam have a complete scissor bite (all dentition elements (premolars/molars) are present. 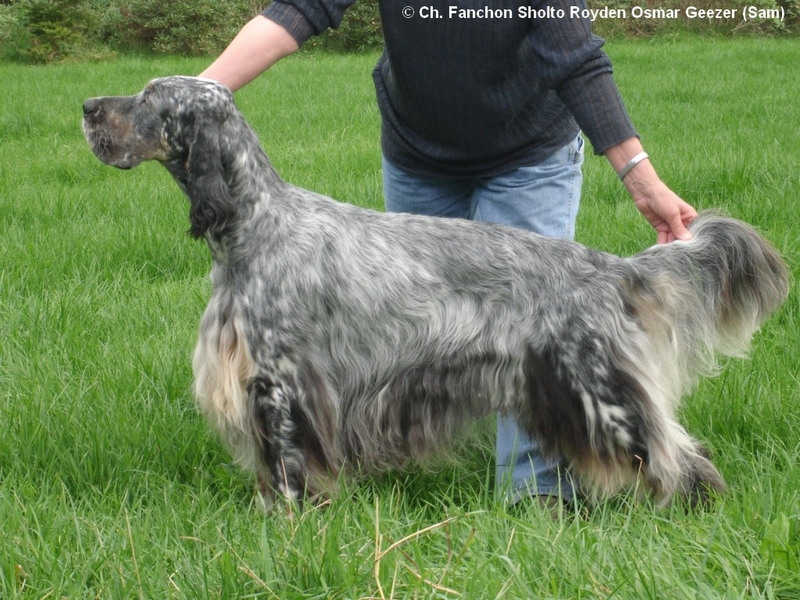 In Jayda's first litter, May 2010, also born the male: Fanchon Paints It Black Jack (Jamie), see for pictures, LINK en LINK. Pictures of both parents will be posted soon. About videos and picture of Lola's puppies. 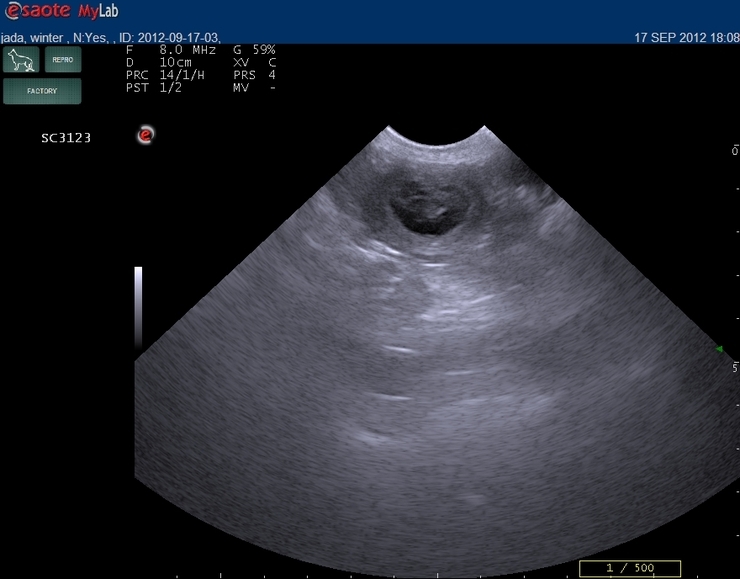 Above Videos and Ultra Sound picture are done by small animal Vet: Mrs. Lucy Valkering. For direct access to Vet's website click on LINK or banner DAC.